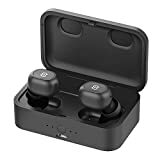 Wireless earbuds are great for convenient audio listening and talking on the phone without getting tangled up in wires or being tethered to your device. They’re especially handy for working out or staying hands-free while driving. With so many earbud options to choose from though, it can feel overwhelming to make the right choice. This buying guide will clear up any confusion, helping you easily choose the right pair for you. 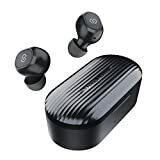 There are a few different types of wireless earbuds to choose from, including standard wireless earbuds, noise isolating, and sport ones. Whatever you need your earbuds for, there’s a pair out there that’s best for you. To help you to compare wireless earbud types, here is a short description of each to help you choose. 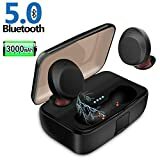 Standard Wireless Earbuds: Wireless earbuds connect remotely to a smartphone or mp3 player. 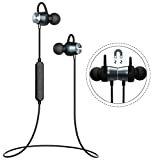 They have good overall quality for universal audio functions while on the go. 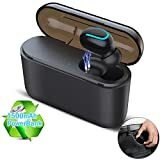 Noise Isolating Wireless Earbuds: Noise isolating wireless earbuds block sound from the outside so that you get the clearest, richest sound from the earbuds directly to your ears. They are best for busy commuting or travel, where background noise may be an issue. 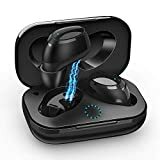 Wireless Sport Earbuds: Wireless sport earbuds are made for long-term comfort and a more secure fit while moving around, and are durable against water, sweat, and grime. Specifically designed for the active users, sport earbuds are perfect for gyms or to take with on your next jog in the park. 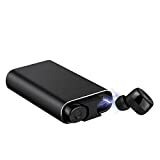 Audio: Audio performance in earbuds has improved significantly over the past few years and consumers rate the wireless earbuds with crisp and clear sound quality the best. Jaybird Bluebuds offer clear audio without white noise while MEElectronics earbuds have enhanced bass tones for energetic listening while working out. Battery: The most popular earbuds have battery life of at least 5 hours of audio and talk time. Consumers rate highest the earbuds they can wear throughout the day without needing to recharge. Controllers: Consumers prefer the wireless earbuds with in-line controllers the most. 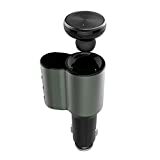 This feature is important for quick control of audio while driving or exercising so you can safely remain hands-free. Comfortable: Reviewers prefer earbuds that fit snugly and comfortably in their ears without causing discomfort over long periods of wear. They also rate higher the earbuds that stay securely in the ears without falling out very easily. Consider sound quality when deciding on a pair of wireless earbuds. 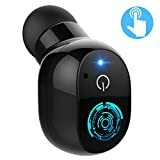 Sound technology has greatly improved in wireless earbuds in recent years, and some earbuds will emphasize different types of sound for music listening, while others will deliver an overall good quality for hands-free talking on the phone or listening to podcasts. Battery life is an important aspect of any gadget, and wireless earbuds are no exception. When choosing a pair of wireless earbuds it’s important to have ones that will last as long as you need when you don’t have a chance to recharge them. Consider how long you’ll be using your earbuds on the go when buying a pair as well as the hours of battery life that different wireless earbuds offer. If standard earbuds don’t usually fit you well, look for a pair that come with different ear tip sizes so you can find the best custom fit for you. Having multiples on hand is also especially helpful in case you lose an ear tip. 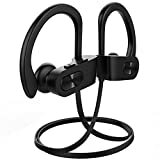 Added features to keep in mind for wireless sport earbuds are a headband that stays snugly around the back of your head while you exercise for a lot more comfort or an included wire that some earbuds include that wraps behind the ear to stay in place as well. 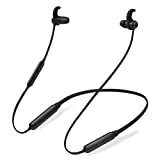 If you are shopping for wireless sport earbuds, look for ones that are sweatproof or waterproof. This will protect the earbuds from frequent use while exercising so your earbuds last a long time. Keep in mind the level of comfort of earbuds after wearing them for extended periods of time. 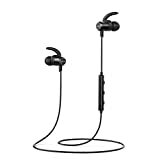 Some sport earbuds, such as the MEElectronics Sport-Fi have memory wire, which conforms to the shape of your ear for an added bonus of comfort and security in your ear. Jaybird: Jaybird LLC specializes in sport technology. The Jaybird Bluebud X series of wireless sport earbuds are compatible with almost any device and feature in-line controllers, replaceable ear tips, and exceptional bluetooth playback. Jarv NMotion: Jarv NMotion is a mobile accessory brand that specializes in bluetooth speakers, headphones, and fitness accessories. 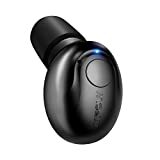 The Jarv NMotion Wireless Noise Isolating Earbuds deliver high-quality sound and multi-function controls for easy, hands-free listening. MEElectronics: MEElectronics is a company that started in 2005, making MP3 players and has since expanded to accessories and headphones. 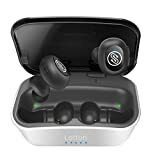 The Sport-Fi series of wireless earbuds and headphones are designed with active lifestyles in mind and are backed by top-rated customer service. Shenzhen ECSEM Technology: Shenzhen ECSEM Technology is a electronics techonology company and it has been creating innovative bluetooth products since its founding in 2009. Their stereo bluetooth headsets include features such as noise cancellation, voice prompts, and extended battery life.